Probably the most ignored time to travel- the spring season- can turn out to be the prime time to rejoice in hill stations and other small towns. Here are 4 nice places in India that should be visited during the perfect season of the year. Located in the southern part of the Great Himalayas, the entire state of Uttrakhand is endowed with enormous natural beauty. The charm of the place is multiplied in springtime when the valley of flowers comes to life with a plethora of colours. Undoubtedly, it is a lovely sight to behold! Thekkady is a small town in the state of Kerala that is famous for its lush fields. Periyar National Park is located near Thekkady and it is an ultimate destination to be in during the springtide. Many animals become active after the long period of hibernation within the forest. Also, by the beginning of March, the mango plants in Kerala are in full bloom which is again another pretty sight. The tulip gardens in Gulmarg, literally are synonymous to Switzerland in the spring season. It becomes a must visit because of the flowering season in March and April and it better to book your room in advance of reaching there as the number of people visiting the area reaches sky high during springtide. 4. Kanha National Park, Madhya Pradesh Situated at a short distance from a small town near the Narmada river- Mandla, Kanha National Park is popular for its accommodation of more than a thousand types of flowering plants. The soothing open grasslands and the greenery make it an ideal place to be when the winters recede. Now that we have told you about these 5 great places, we have something more to add to your happiness! Sellebrate travel gift cards! You can buy gift cards from us at a discount and book your flight and hotel tickets in advance via platforms like MakeMyTrip and Clear Trip or maybe you can gift them to your loved ones for travelling during this Spring season. We are sure that they will really appreciate and value this useful gift. 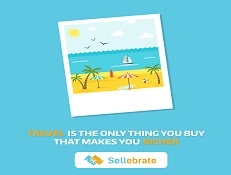 Celebrate travel with Sellebrate!